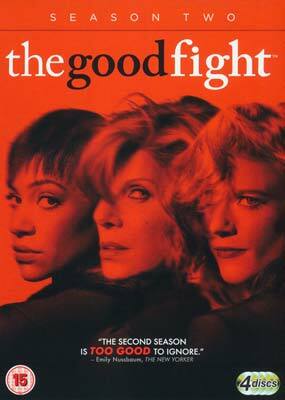 Good Fight, The: Season 2 (4-disc) (DVD) - Laserdisken.dk - salg af DVD og Blu-ray film. Scott Free Prod. - 2017-???? Christine Baranski er tilbage som Diane Lockhart i denne spinoff serie, The Good Fight, der begynder et år efter begivenhederne i sidste afsnit af The Good Wife. Et omfattende tilfælde af økonomisk bedrageri har knust den unge advokat Maia Rindells omdømme, og på samme tid har det ødelagt hendes mentor og gudmor Diane Lockharts opsparing. De tvinges til at forlade Lockhart & Lee og slutter sig til Lucca Quinn ved et af Chicagos mest fremtrædende advokatfirmaer. Trying to maintain sanity in these insane times, the attorneys of Reddick, Boseman and Lockhart gain a new partner, endure a serial threat against lawyers, and brave a chaotic new world. Diane goes to extremes to deal with a growing threat, her struggling marriage and ever-changing politics. Meanwhile, Lucca, Maia and the firm expertly navigate a crooked cop conspiracy, a high-profile deportation and an audition for the DNC in a potential impeachment case.